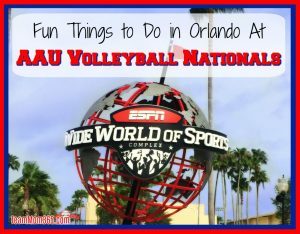 Next week one of the biggest volleyball tournaments in the world will begin in Orlando. Over 26,000 athletes along with their parents, siblings, coaches and fans from across the United States (and even the world) will be converging for two weeks of sun, fun and volleyball at AAU Volleyball Junior Nationals. This means hundreds of thousands of people will be looking for fun things to do in Orlando. Unlike other sports tournaments, volleyball Nationals happens in waves. Taking place over four days, the first two days teams will play in either the morning or afternoon wave. Teams assigned to the morning wave typically play from 8:00am – 2:00pm while teams in the afternoon wave are there from 2:00pm – 8:00pm. The second two days are up in the air depending on how they play. Day 3 could even require a team to play in the morning wave then again in the evening for a one game cross over match. The final day is bracket play is played until you lose. After that you line (ref) the next game on your court, if there is one, then you get to leave… or as it’s lovingly called by volleyball faithfuls “lose, line, leave”. If you are lucky enough to get the morning wave you will still have the majority of your day to enjoy all Orlando has to offer. However, before making any plans of a strenuous nature, such as walking around a hot theme park for hours on end, make sure to ask your coach if they are okay with that kind of activity during the tournament. The volleyball club my daughter played for in the early years didn’t even allow swimming while the tournament was taking place so visiting a theme park was definitely out. While it is possible to have some fun times either before or after your play time, you really won’t get to experience all Orlando has to offer unless you arrive a few days early or stay a few days over. Those few days can make all the difference in the world as far as (1) ramping up the excitement or (2) decompressing after a hard-played tournament. I know what you are saying, “There’s no beach in Orlando.” Trust me, I know this. However, Orlando is positioned perfectly for a beach day at it is located near the center of Florida. Two of the most popular beaches are within an hour or so from Orlando. Cocoa Beach is just a hop, skip and a jump from Orlando. Taking between 45 – 60 minutes, it’s the closest beach to the Orlando area… and the cheapest. Even with the tolls you will pay on Highway 528 (the Beeline) of approximately $10 roundtrip, it is cheapest beach in the area to visit as there are rarely entrance or parking fees. When visiting Cocoa Beach, we like to go to Lori Wilson Park because the parking is plentiful, free and very close to the beach. The facilities at the park include restrooms, 2 pavilions, a nature boardwalk, a beach volleyball court, a playground, barbecue grills, and a dog park. They also offer chair and umbrella rentals. 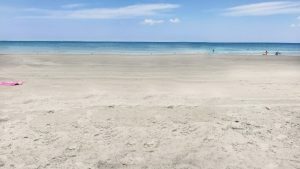 We spend our days at Cocoa Beach playing beach volleyball, cooling off in the refreshing waters of the Atlantic, body surfing and playing in the breakers. One of the big difference between the Atlantic and Gulf coasts is wave size with the Atlantic side boasting more much wave action than the Gulf. If you are traveling with little ones this is something you might want to take this into consideration. If you chose to add a beach day to your Disney Sports Vacation there is a way to get a little Disney back in your day. 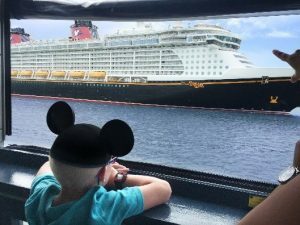 On Mondays, Fridays and Saturdays Disney Cruise Line ships come and go from Port Canaveral. The ships leave between 4:00pm and 5:30pm. There are two places to watch the ships head off on their voyage. The first is right from your blanket at the beach. As the ships leave Port Canaveral they make a 90° turn south, they sail right passed the beach. The second is from Fishlips Waterfront Bar & Grill. This restaurant is located on the causeway which leads to the Disney Cruise terminal. Not only do they have a perfect waterfront spot to view the ships traveling the causeway, they also have a great menu of fresh fish dishes and traditional bar fare and the prices are extremely reasonable. Another claim to fame of Fishlips is that it is the home of the Port Canaveral Webcam which is a fun way to keep the Disney magic alive even when you are at home. Clearwater Beach, located just south of Tampa, takes a little over an hour to reach (depending on where in Orlando you are staying) but doesn’t require any tolls. What it does require is parking fees which can be up to $30 for the day and most lots on the infamous Gulf Boulevard fill well before noon. However, a diamond in the rough on the Gulf Coast is Sand Key Park. Sand Key Park is located just south of Clearwater Beach. The park features plenty of parking, shower facilities and lots of beach space for the bargain price of $5/day. On our beach days at Sand Key, we spend a lazy day catching some rays, searching for starfish and shells, walking up to the jetty and wading in the warm Gulf water. One drawback of the Gulf coast came to light when the day we visited was nearing 100°. Given the warmth of the Gulf waters this made it hard to cool off even when you were in the water. It was the epitome of the term ‘as warm as bath water’. In addition to the beach, the Tampa/Clearwater does offer some other fun destinations such as the Busch Gardens and Clearwater Marine Aquarium which is the home of Winter, the dolphin from A Dolphin’s Tale. It’s no secret that Florida is full of alligators… and not just the kind residing in Gainesville. However, I don’t think anyone of us wants to come face-to-face with one in the wild. If do want to experience these prehistoric creatures, Gatorland is the place for you. Reasonably prices at under $40/day, it’s not just gators you will encounter, they also have birds, wild cats, snakes, tortoises and other critters. They also offer packages which allow guests to feed the gators. 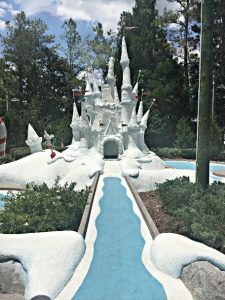 Miniature golf is an inexpensive way to spend down time with the team or just your family and Orlando has no shortage of courses to pick from. Depending on where you are staying, there are courses on W. Irlo Bronson Drive (near Disney) and on International Drive (near Universal). Our team (and a few we inherited from another team when they heard we were going) had a great time at Pirate Cove Mini Golf Course on I-Drive. Walt Disney World is no slouch on the mini golf game either. They have two incredible courses on-property. Wintersummerland (pictured here) is located near Blizzard Beach Water Park and can be accessed by the Blizzard Beach bus if you are staying on-property. It is themed after the Christmas holiday season. Fantasia Gardens located near the Boardwalk Area and is built in the whimsical theme of Sorcerer Mickey. It’s a little trickier to get to Fantasia Gardens if you are staying on property. There are two ways you could get there. First, you could take a bus to the closest theme park then transfer to a bus headed to Disney’s Swan Resort. The course is located across the street from the resort. The other way to get there is to take a bus to Disney Springs then transfer to the Fantasia Gardens’ bus. Located only a few blocks from the Orange County Convention Center; the Orlando Eye is a Ferris wheel on steroids. Taking up to 25 minutes for one revolution, you get a bird’s eye view of Universal Studios, I-Drive, SeaWorld, downtown Orlando and off in the western horizon you can even see prominent parts of Walt Disney World property such as Spaceship Earth, Characters in Flight (when it’s up) and Space Mountain. At $26 per person, it’s a bit pricey given the length of the attraction but it’s super fun. A word of warning, if anyone in your group is afraid of heights, this could be a pretty terrifying experience. One of my daughter’s volleyball coaches might have spent the entire ride as white a snow. Even though Sea World has received a bad rap in the last few years, it is indeed still up and running and it’s still a mecca for family fun. They even opened an innovative new rollercoaster called Kraken Unleashed everyone has been raving about which is a cross between rollercoaster and virtual reality attraction. No need to fret for the traditionalists reading this, they still have the classic animal experiences you have come to know and love. If you are a wizard in the making Universal Studios – Orlando is the place for you. Home to The Wizarding World of Harry Potter, Universal is the park of choice for those who are looking for death-defying rides. 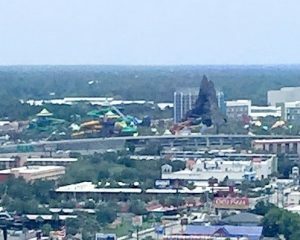 The sections of Universal include the original Universal Studios, Islands of Adventure, Volcano Bay Water Park and City Walk entertainment district. Unfortunately, Universal is not affiliated with the tournament so you will have to pay full price for theme parks tickets, which can be up to $115/day. And last, but definitely not least, you know you can’t go to Orlando without stopping in to see my favorite mouse. No what matter what kind of entertainment you are seeking, Walt Disney World has the thing for you. World class theme parks – got it; Broadway quality shows – got it; Out of this world dining experiences – got it; Water parks – got it; Entertainment for all ages – go it. 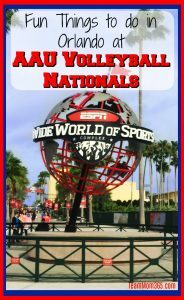 Make sure to check out the discounted theme ticket which come with your team’s participation in AAU Volleyball Nationals. Depending on the number of days you purchase, you could save up to 34% on your theme park tickets when compared with purchasing them directly from Disney. Another Disney destination a lot of teams enjoy is Disney Springs. Disney Springs is an entertainment, retail and dining district location just off I4. It includes all the high class amenities you have come to expect from Disney with national renowned restaurants such as Hard Rock Café, Rainforest Café, and Earl of Sandwich and fun activities for the whole team such as bowling at Splitsville Luxury Lanes, Fork & Screen movies at the AMC Dine-In theatre and Characters in Flight balloon ride.